The 102-year-old twins have eight children, 21 grandchildren and 47 great-grandchildren between them. Two 102-year-old sisters have been recognised as the world's oldest living twins by the Guinness Book of Records. 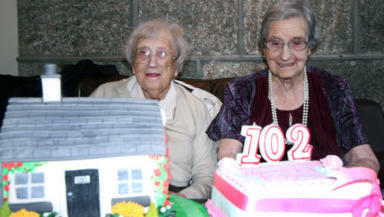 Edith Ritchie and Evelyn "Evie" Middleton, born in 1909, celebrated their latest birthday on November 15 last year. The twins, whose maiden name is Rennie, were born on a farm near Newburgh in Fife when Edward VII was on the throne. They have remained close over the past 102 years and now live together in Bonnyton House care home in Ellon, Aberdeenshire. Although not identical, their mother always dressed the girls exactly the same. After leaving school, the pair worked on farms before leaving to start their own families. Evelyn married William Middleton and had four children, 12 grandchildren, 26 great-grandchildren and three great-great grandchildren. Edith married Nathaniel Ritchie and had four children, nine grandchildren, 21 great-grandchildren and three great-great grandchildren. Neither of them has ever travelled outside of the UK. When asked her secret to a long life, Edith said: "Simple living, hard work and a good husband." Guinness World Records editor-in-chief Craig Glenday said: "Edith and Evelyn are a remarkable pair. When they were born the likes of Mark Twain and Florence Nightingale were still alive and we had yet to conquer the South Pole. "They're not just the oldest in the UK, they hold the world title. They've clearly benefited from good genes and a solid lifelong friendship that only twins can truly understand."